If you received (and read) the most recent edition of Councilor Jake Auchincloss’s newsletter, you got a treat: an informative (and fun!) 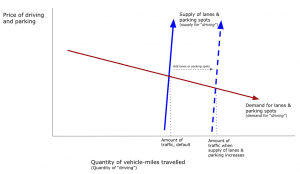 discussion of the economics of traffic. Go ahead and read it. We’ll wait. As Jake explains, traffic is as much economics as engineering. Traffic follows the law of supply and demand. The key insight over the last several years is that demand for cheap car travel is effectively unlimited. If you add capacity (say add a lane to 128/95), you won’t simply spread out existing demand for three lanes over four lanes and improve traffic flow. People who were previously deterred from driving because of the low throughput will see the improved conditions and now drive. The additional capacity is almost immediately consumed by new drivers. And, you’re back to the previous state of congestion, just with more cars. This phenomenon is called “induced demand.” Congestion does not reflect all of the demand jockeying for the limited capacity. There is always latent demand. Always. In his newsletter primer, Jake also explains that you can induce demand with additional parking, just as much as with adding travel lanes. Parking is a limit on the capacity of our motor-vehicle travel network. Even if you can drive to your destination on free-flowing roads, if you can’t park you’re car at the end of the trip, you are deterred from driving. Likewise, if you can’t get free or cheap parking where you live, you’re not going to be able to drive away from your home. Creating parking creates the ability to drive. Creating parking induces demand for our roadways. Parking helps cause congestion. This has obvious consequence at Northland and other developments in the city and also in the proposed zoning reform. Land Use regulations manifest a concern that there be enough parking. Given what we know about parking and its impact on traffic, we should be concerned about too much parking. Jake’s got it right on this one. It’s even worse than what Councilor Auchincloss states. In the actual Northland case, coupled with the expanded road and parking, there IS the additional development. In view of all this, the Northland project is a net loss to the City of Newton. Why do we need or want this development????? What you and councilor Auchincloss appear to miss is that traffic on a particular road (or parking at a particular site) cannot be examined in a vacuum. Our suburban existence forces us to rely on automobiles because there is no existing public transportation infrastructure that can replace them. Widening route 95 does not create new traffic, it simply pulls existing traffic from other roads because the traffic conditions on route 95 have improved to make it the better choice. Conversely, dropping a lane on route 95 wouldn’t reduce traffic, it would simply reroute it off the limited-access highway onto city streets, increasing the traffic on those streets. This is also the case with parking — if Northland is allowed to build their massively oversized proposed development without sufficient parking, it will not result in fewer people owning cars, it will simply shift the parking burden elsewhere (onto neighbordhood streets) and since Needham street cannot be widened to accommodate the extra cars, it will lead to much worse traffic. In the perfect world, we could use economic analysis and social engineering to wean ourselves off cars, but in this perfect world, we would also have convenient, reliable public transportation — something that, unfortunately, we do not have in the real world. In the real world, we must live within the constraints of our infrastructure; ignoring these constrains will lead to disaster. I corresponded recently with some folks in the Somerville planning department about the overall trend of car ownership there. Measuring in Somerville is a bit more difficult than in Newton because the high amount of rentals means that turnover is higher as well. That said, they are seeing an overall trend of fewer cars per household. Yes, some of the city has decent public transportation, but much of it does not. And it is more dense than Newton. But the other factor they are examining is the connection between wealth, available parking and car ownership. They’re also looking at that in terms of how added parking causes rents to rise, thereby bringing in just those people who add cars to the city. Basically: if you build it they will come. More parking makes housing more expensive (how else are you going to pay for that extra land that’s not bringing income) so you build more expensive units. To Leon’s point, this doesn’t happen in a vacuum. You need to offer safe, convenient and respectable transportation as an alternative if you want people to NOT drive. Uber and Lyft may reduce ownership, but they don’t reduce traffic. We need ways to take more people out of cars and put them on their feet, bikes or in high-occupancy vehicles (buses, vans, trains). When there’s nowhere to park, people just take an Uber. One of my favorite things in the world is when Jake A wonks out on transportation. True Story. Do they also eat cake when they are hungry? @bugek. You don’t have twist every comment on this site into class warfare. The fact is, Uber is everywhere around Newton. I am merely saying that limited parking does not necessarily keep cars off the road. All of the young people in my life (20’s and 30’s) take Uber everywhere.